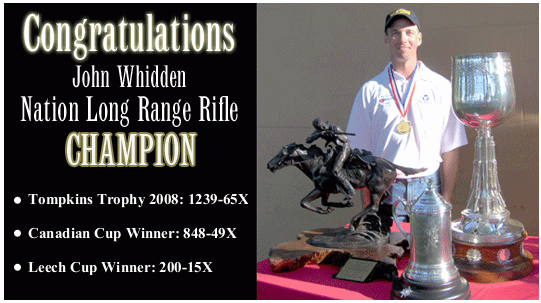 John Whidden won the 2008 NRA Long-Range Championship with an impressive 1239-65X score. This was the second straight Long-Range win for phenomenally skilled but modest Georgia-based shooter, who also took the title in 2007. On the way to the overall win, Whidden also captured the Canadian Cup (848-49X) and the Leech Cup (200-15X). The NRA Long-Range Championship went down to the wire. Whidden secured the victory on X-count, with an edge of eight Xs over runner-up Robert Gustin of California who finished with 1239-57X. (Gustin was also high Senior.) Army Shooter Sgt. Brandon Green finished third at 1238-64X, just one point behind. 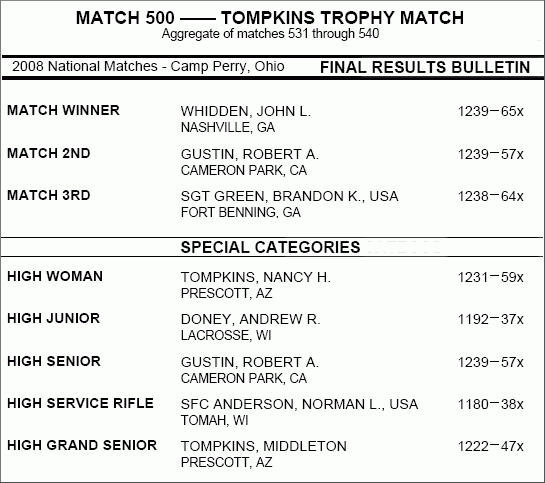 Nancy Tompkins, popular author of the Prone and Long-Range Rifle Shooting book, was the top female shooter, posting 1231-59X. After winning the 2007 NRA Long-Range Championship, John Whidden provided the following commentary to AccurateShooter.com (John regularly posts in our Shooters’ Forum). We’re not sure if he changed his equipment this year–we’ll provide updates on that as soon as possible. Winning the National Championship is a long-time goal realized. For me, being the National Champion was the single biggest shooting goal I had. I’m not sure exactly what will be my next shooting goal yet. If I had to summarize the mental game at this level of competition in one word, I would probably choose the word “Confidence”. You have to have the highest level of confidence in your skills, your rifle, and your ammo. There can’t be even a shadow of a doubt that all of your equipment is the best there is. No detail can be left undone. Confidence is a far-reaching idea. It includes little things like making sure you have all of your equipment with you through the use of a checklist. Anything you can do to give yourself a higher level of confidence is worth doing. In NRA Long Range, we shoot “Any Sight Rifles” and Palma rifles. The Palma rifles have to be .308s and they have to use Iron sights. The Any Rifles are used at different times with iron sights or scopes. They are also fairly unrestricted, as long as they are safe, .35 cal or under, and have no muzzle brake. For the Any Rifle matches [in 2007], I shot rifles chambered in .243 Win. My iron sight gun is a Winchester M70 action, Broughton 1-8 twist 5C barrel, Anschutz trigger, Robertson Original stock, and Warner rear sight. My scope gun is a Stolle Panda action with an Anschutz trigger, Broughton 1-8 twist 5C barrel, Roberston Composites Original stock, and a Nightforce 8-32x BR scope. All of my rifles are proud products of the Whidden Gunworks custom shop. I shoot the same load in each: Berger moly coated 105 grain VLDs, Vihtavuori N160, Lapua brass, and PMC (Russian) primers. Share the post "Whidden Wins NRA Long-Range Championship–Repeat Victory"
The August running of the Allegheny Sniper Challenge (ASC) will take place this Saturday and Sunday, August 16-17, at Seneca Rocks, West Virginia, right on the Eastern Continental Divide. This is a “practical” field competition requiring shooters to walk through the countryside engaging targets, many at unknown distances and at difficult up or down angles. Every day has a scored, cold bore shot (CBS) so your rifle better have a reliable zero. The terrain is challenging, with lots of hills to climb; elevation at the match site is about 3,500 feet. Yes, that’s a row of shooters lined up on the hillside. To give you an idea of the kind of shooting done at ASC, we’ve provided a video. Click the above photo to see a VIDEO showing Asst. Editor Jason Baney hitting multiple metal targets in a timed, rapid-fire sequence at last year’s ASC. Note how Jason has to swing the rifle around and adjust for angle and elevation changes. In this stage, Jason engaged seven targets from 200 to 600 yards, starting at 350, then moving out to 600 and back to 200. Jason says: “There was a 20 mph full-value crosswind running and we weren’t allowed to touch the scope. That’s a serious hold-off.” Jason was one of the few ASC shooters to “clean” this stage, hitting all targets. For more information about the Allegheny Sniper Challenge, visit http://asc.riflemen.net/. 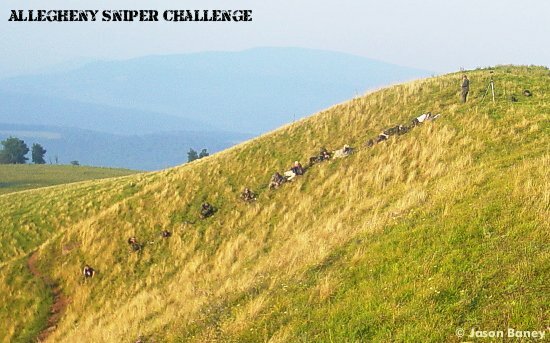 Also check out this ASC BLOG PAGE covering 2005 and 2007 Sniper Challenge events. Click on the small thumbnail photos to see galleries with dozens of ASC photos. 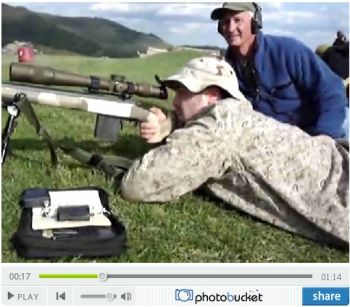 Share the post "Allegheny Sniper Challenge This Weekend"